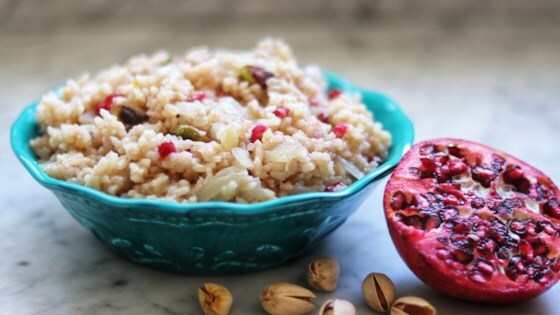 "This rice pilaf with pomegranate seeds and pistachios tastes great with grilled fish or meat, especially lamb. Make sure the rice does not get sticky. It is supposed to be light and fluffy." Heat oil in a saucepan over medium heat and cook onion until soft and translucent. Add rice and toast until fragrant, 2 to 3 minutes. Pour in hot vegetable broth and bring to a boil. Add saffron and allspice, reduce heat to medium-low, cover, and simmer until rice is tender and liquid has been absorbed, about 20 minutes. Toast pistachios in a skillet over medium heat until nuts start to turn golden brown and become fragrant, 5 to 10 minutes. Set aside. Stir butter into the cooked rice. Remove from heat and mix in pistachios and pomegranate seeds. Fluff with fork and season with salt and pepper. Never make sticky, mushy rice again! I always love an excuse to use saffron, and this delicious rice was a great use for it. Easy to make, too, exactly as described.